Ferret Music recording group The Devil Wears Prada and Metal Blade Records’ As I Lay Dying have announced details of their upcoming North American co-headline tour. The hugely anticipated trek gets underway February 22nd at Ventura, California’s Majestic Ventura Theater Half House and then continues through early April (see attached itinerary). Tickets for all dates will be on sale Friday, December 21st. The tour follows The Devil Wears Prada’s 2011 breakthrough, “DEAD THRONE,” which confirmed the band as one of the most potent and powerful in modern American metal. The album’s latest video, “Mammoth,” premiered to great acclaim earlier this year and is streaming now at the band’s official YouTube channel, www.youtube.com/TDWP. The Devil Wears Prada followed the release of “DEAD THRONE” with the hugely successful “Dead Throne Tour: North America,” captured for posterity on the recently released CD/DVD, “DEAD&ALIVE.” The collection includes performances of songs spanning TDWP’s career, including such fan favorites as “Danger: Wildman,” “Born To Lose,” “Kansas,” “Assistant To The Regional Manager,” and “Outnumbered.” In addition, “DEAD&ALIVE” features an array of behind-the-scenes footage shot and edited by the band’s own Jeremy DePoyster. Long hailed as a genuinely electrifying live act, The Devil Wears Prada have also proven indefatigable road warriors. In addition to countless headline dates and festival sets, recent highlights include spending summer 2012 alongside Slipknot, Slayer, Anthrax, and the one and only Motörhead as one of the main stage headliners on the all-star Rockstar Energy Drink Mayhem Festival. 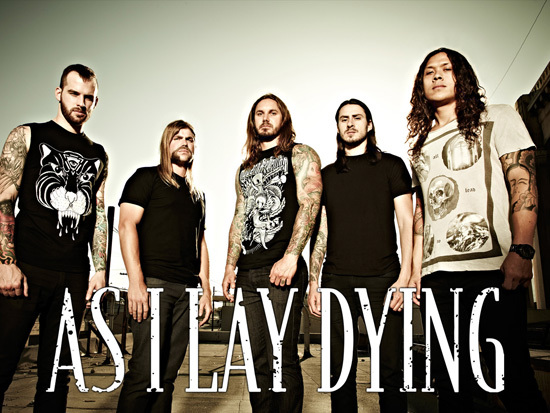 As I Lay Dying preceded the release of their 6th full-length studio album, “AWAKENED,” with a highly successful run on 2012′s Rockstar Energy Drink Mayhem Festival where the band rotated between the side and main stages. Just before “AWAKENED” dropped via Metal Blade Records on September 25th, the band released their first production video for the album for the track “A Greater Foundation.” Fans instantly took to the Internet to express their love of the new song – AND to discuss the relevance of the lyrics. Check out the video and comments HERE. The five-piece San Diego, Calif. based metal act, As I Lay Dying, recently concluded their run on the Monster Energy Outbreak Tour where they toured alongside Asking Alexandria, Memphis May Fire, and Attila, including a stop at the hugely successful California Metal Fest where the band electrified the stage and decimated metal fans with their powerful and blistering live set that the band is known for. “AWAKENED,” which Rick Florino from Artist Direct called “…their best album yet,” noting “it’s a high water mark for modern metal, and it’s going to wake up the entire genre” giving the release 5 out of 5 stars, debuted on the Billboard Top 200 Albums chart at #11, selling over 28,000 copies in its first week in the US alone. For their latest release, “AWAKENED,” As I Lay Dying –NICK HIPA (guitar), TIM LAMBESIS (vocals), JORDAN MANCINO (drums), PHIL SGROSSO (guitar) and JOSH GILBERT (bass)–holed up in the Blasting Room in Fort Collins, CO with renowned rock producer Bill Stevenson (Descendents) and mixer Colin Richardson. The group’s last LP, 2010s “THE POWERLESS RISE,” debuted on the Billboard Top 200 at #10, at #2 on Billboard’s Independent Albums Chart and #3 on Billboard’s Hard Music Albums Chart.